Samdump is written by Adam Cecile . 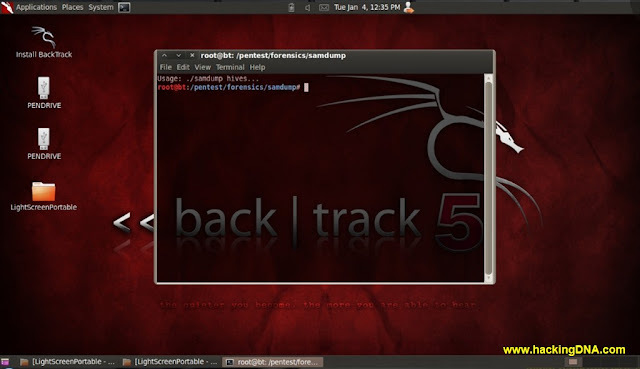 Samdump is a Password Forensics Tool in Backtrack 5 . Samdumps -- dumps the Windows 2k/NT/XP password hashes from a SAM file . bkhive tool is also used here to find the syskey . Syskey is a Windows feature that adds an additional encryption layer to the password hashes stored in the SAM(Security Account Manager ) database. John the Ripper is also usedhere to crack the hash . Command : cd /mnt/windows // Navigate to windows partition. cd Windows/System32/config // Navigate to config directory. cd /pentest/passwords/john // This command used to navigate to john dir. Remember : Simple password crack easily and complex password takes time to crack.